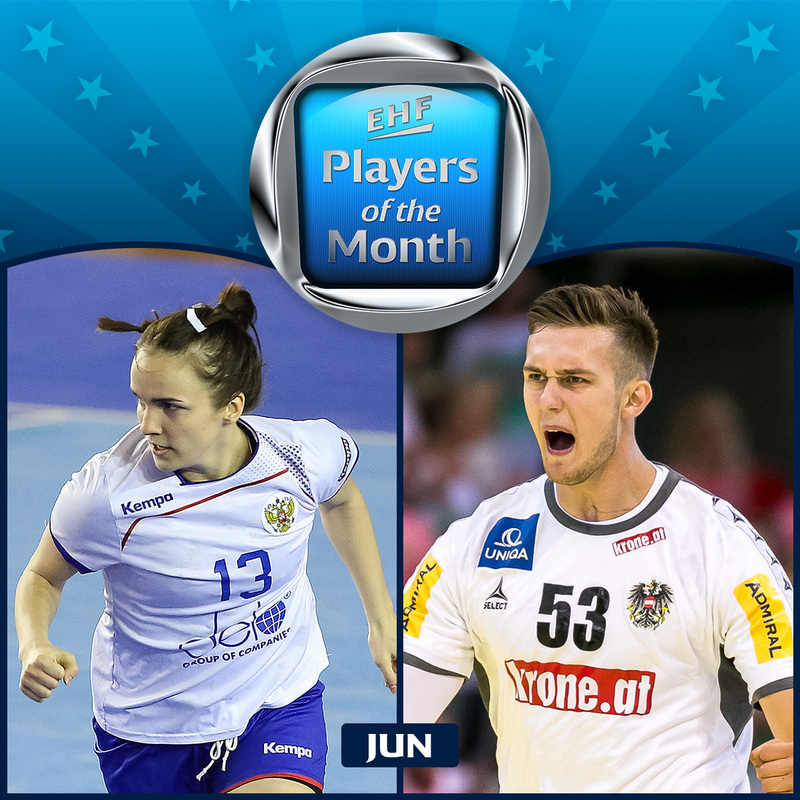 NEWS REPORT: The Russian right back and Austrian playmaker claimed the EHF Players of the Month awards for June. An excellent game for their national teams helped Russia's Anna Vyakhireva and Austria's Nikola Bilyk to be elected the best players of last month. The European club competitions had already finished by June, so the voting for the EHF Player of the Month awards in June was based solely on the national team's games - in the first summer month, women completed the EHF EURO 2018 qualification, while men competed in the World Championship 2019 playoffs. Having won the Russian league and reached the Women's EHF FINAL4 with Rostov, Anna Vyakhireva finished the season on a good note, as she had a great impact in Russia's two final matches of the EHF EURO 2018 qualification in June. In Portugal, the 23-year-old scored 11 goals as Russia comfortably won 30:24, but it was still on the last day of May. However, Anna carried her good form into June, netting even more - 12 times - in the crucial home game with Austria. A narrow 26:25 win saw the Russian team finishing second in the group and qualifying for the EURO. And after the end of the handball season, Vyakhireva had a busy time as well, as she finished her studies at Astrakhan university and got a diploma after defending her thesis. Other players who made it to the shortlist in the race for the June award were the Serbian right wing Katarina Krpez Slezak (Érdi VSE), Romanian centre back Eliza Buceschi Corona Brasov, Czech Republic's centre back Iveta Luzumova (Thüringer HC) and Hungarian left back Dora Hornyak from FTC-Rail Cargo Hungaria. Bilyk: "It's a huge honour"
By scoring twelve goals in the World Championship 2019 playoffs against Belarus (28:28, 32:26), the 21-year-old left back was one of the keys for the Austrian ticket to Denmark and Germany. “Of course, I know which role I play in our rejuvenated team, but I like to take this responsibility. I do not count the goals I score, it is about helping my team and doing all for the success of the team,” Bilyk said on his performance in the playoffs. The EHF Player of the Month award as first ever Austrian is another record in his career: Bilyk has become already MVP and top scorer at the U20 EHF EURO 2014, he was only 17 years old, when he had his debut in the men’s national team and as he just had turned 18, he was the youngest of all players at the 2015 World Championship in Qatar. At the age of 22, Bilyk will play his second World Championship in January. “The anticipation to play a World Championship in two of the most handball-enthusiastic countries of the world is huge, personally for me, but for all of our team. Therefore, it was so crucial to take revenge for our EHF EURO 2018 defeat against Belarus in the playoffs. We knew that we had the chance to beat them, and finally we were focused to make it,” says Bilyk. “Finally, we were drawn into a group, in which we can hope to proceed to the eighth-finals again, like we did in 2015. This is our hope and dream,” adds Bilyk, who is currently enjoying holidays. On 14 July, the preparation for his third season at THW Kiel will start – the last one, steered by Alfred Gislason, the first one, with the new assistant coach Filip Jicha, Gislason’s successor from 2019 on. In 2016, Bilyk started to enter Jicha’s footsteps – and now is on the best way to become a star like Jicha. The young Austrian was followed by Switzerland's playmaker Andy Schmid (Rhein-Neckar Löwen), Norway's centre back Sander Sagosen (Paris Saint-Germain Handball), Icelandic left wing Gudjon Valur Sigurdsson (Rhein-Neckar Löwen) and Slovenia's right back Vid Kavticnik (Montpellier Handball) on the shortlist for the award.